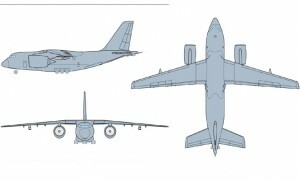 Side view drawings of the An-112KC concept. Continuing the somewhat farcical nature of the US’s ongoing attempts to replace its fleet of 45+ year old KC-135 tankers, the USAF has excluded the bid by US Aerospace for the KC-X tanker replacement program due to it being submitted to project officials five minutes after the 2.00pm, July 9 deadline. US Aerospace says the bid, which proposes the An-112KC, a radical twin jet variant of the Antonov An-70 four engine turboprop airlifter, arrived at the gate at Wright Patterson AFB at 1.30pm on the due date, but the company claims the courier was initially asked to wait and was then given incorrect directions to the project office. When the courier finally delivered the bid, it was time stamped 2.05pm, and the USAF has since decided the bid will not be considered on this basis. As a result of its exclusion, US Aerospace has appealed to the US Government Accountability Office for its bid to be re-instated, claiming the bid was “under the USAF’s control” well before the cutoff, and that USAF officials “intentionally delayed the messenger from delivering our proposal to create a pretext for refusing to consider it.” The GAO is due to rule on the appeal on November 7, two days before the winning tender is due to be announced. The two other bidders – Boeing with its KC-767NG and EADS North America with its A330-based KC-45 both delivered their bids on July 8.